Potter Group Logistics provides specialist third-party logistics (3PL) services to the chemical, pharmaceutical, food and animal feed sectors. The company recently selected CALIDUS WMS from OBS Logistics to gain the benefit of over-the-web interfacing with customers and easy EDI connectivity for paperless and automatic ordering. 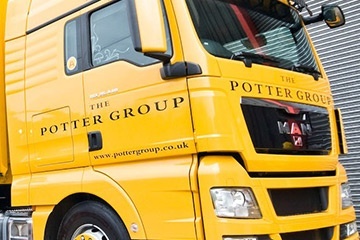 The new system is a major investment in enterprise-level technology that will help Potter Group Logistics to continue to deliver superior customer services. Potter Group Logistics was established by founder and executive chairman Derrick Potter in 1965. Today the business employs more than 200 staff providing high quality, UK freight, warehousing, distribution and logistics services to clients in almost every type of business from five national distribution centres (DC). The company provides both road transportation and operates its own dedicated rail terminal connected DCs in Selby (Yorkshire), Knowsley (Merseyside) and Ely (Cambridgeshire). It has a total of 1.6 million sq feet of warehousing and 250 acres of external bulk storage across its five DCs. Each DC is fully equipped to handle most packaged or bulk configurations, including palletised and block-stacked goods, parcels, boxes and cartons, drums, paper reels, ISO containers and bulk materials. 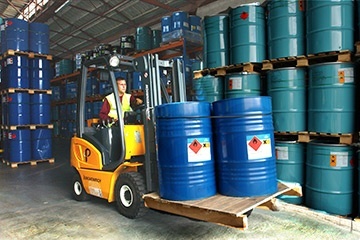 Potter Group Logistics’ Droitwich, Knowsley and Ripon DCs specialise in chemical and hazardous product storage and distribution, with fully equipped warehouse facilities, including sprinklers and specially modified handling equipment. These locations operate to top tier COMAH standards. The Selby facility includes extensive food warehousing and, along with the DCs in Ely and Ripon, it handles bulk products to TASCC standards. Over the years our system has proved its worth, but with the rate of change we see in the market today, it is clear we will benefit from having the support of a much larger company handling our WMS requirements. The company focuses on consistently meeting client and market requirements. This approach has resulted in successful and mutually beneficial long-term partnerships with leading companies, including Elanco, Johnson Matthey, Capella, Glencore and CEMEX. To meet the evolving needs of its customers the company and its board resolved to upgrade its warehouse management system (WMS) in order to provide easier communications, stock and order visibility. Potter Group Logistics has selected CALIDUS warehouse management system (WMS) from OBS Logistics to help manage its five national distribution centres. The WMS will be used at the Group DCs in Ripon, Selby, Droitwich, Knowsley and Ely. The system will provide important benefits including over-the-web interfacing with customers and easy to set up EDI links for paperless and automatic ordering. The Group is also evaluating the use of the system’s wireless barcode scanning feature with Motorola handheld scanners. The new system is a major investment in enterprise-level technology that will help Potter Group Logistics enhance its customer service offerings. "CALIDUS WMS offers the features and functionalities we need," says Ken Watson, Finance Director and Head of IT for Potter Group Logistics. He continues, "The barcode scanning option, for example, is an out-of-the-box standard feature that is integrated with the WMS and we are giving it careful consideration. It is this fully featured integration that stands out the most. OBS Logistics has more than 60 live installations of CALIDUS WMS worldwide and this gave us confidence that the system will deliver. We have high expectations for our IT investment and are looking forward to building a close partnership with OBS"
OBS Logistics, working with Potter Group Logistics’ IT team, will supply and install the WMS for 48 users across the five sites. The software will be installed on the company’s own dedicated servers, with OBS Logistics providing remote support as and when required. Initially, the company is evaluating barcode scanning for stock management for its Droitwich and Selby DCs. The project team’s aim is to get the Droitwich DC live in August 2012. The remaining sites will be added in monthly intervals until all are benefiting from the new OBS Logistics technology. It is anticipated that all sites will be using CALIDUS WMS by early 2013. Watson concludes, "Over the years our system has proved its worth, but with the rate of change we see in the market today, it is clear we will benefit from having the support of a much larger company handling our WMS requirements. This will allow us to keep up with evolving demands and the pace of change in IT, which in turn will enable us to deliver projects in a timelier manner. In future we are expecting to see financial benefits from using barcode scanning, as it will reduce the administrative burden and costs."